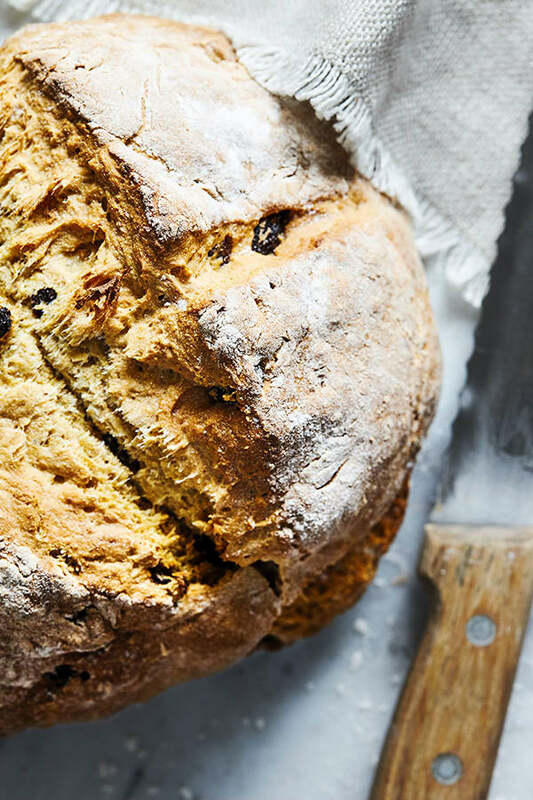 Irish soda bread might possibly be one of the easiest breads to make at home. 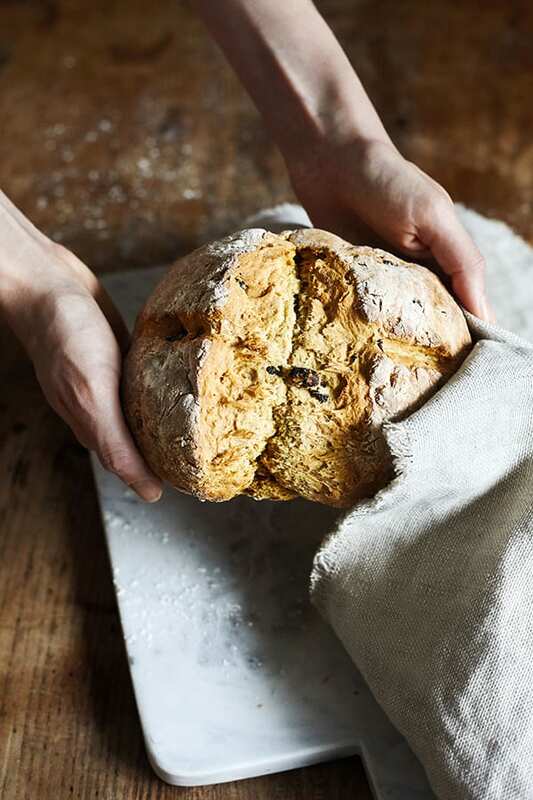 Soda bread relies on a reaction of an acid (buttermilk) and a base (baking soda) to help the dough rise, rather than waiting hours for added yeast to leaven the dough. In fact, Irish soda bread doesn’t need any rise time at all! There’s nothing quite like freshly baked bread, and this one is ready in about 40 minutes. 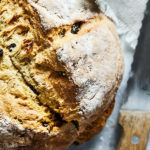 According to lore, Irish soda bread got its name because the “soft wheat” grown in Ireland doesn’t do very well with yeast, unlike the “hard wheat” in North America. And, while it doesn’t develop the levels of gluten that a yeast bread would, it reacts very well with baking soda (something you probably already have in your pantry). Mix all the ingredients in a bowl, shape the dough into a loose ball… and just like that, you’re basically done. A quick trip to the oven develops a golden-brown crust on the outside. Scoring bread dough (cutting a slash or two into the top with a sharp knife) before baking helps to control the direction the bread will rise as it bakes, and prevents it from bursting in awkward ways that that leave the bread misshapen. 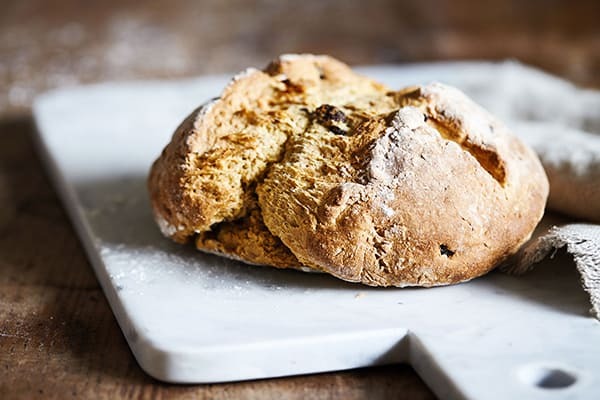 Traditional Irish soda bread is scored with the shape of a cross – and there are a lot of reasons explaining why. Some say it’s good luck, others say it’s a symbol for the cross, and others simply think it makes the bread easier to divvy up. If you don’t plan to use all of the Irish soda bread right away, leftover slices can be wrapped individually and stored in the freezer for future meals. Making an Irish meal for your family? Try our recipes for Irish Stew, Braised Cabbage, or Colcannon. 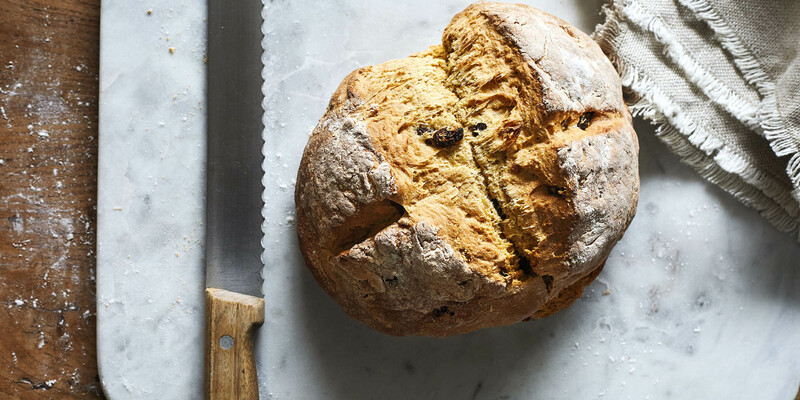 Irish soda bread might possibly be one of the easiest breads to make at home. It doesn't need any rise time, and is ready in about 40 minutes. Combine all-purpose flour, whole wheat flour, baking soda, and salt in a medium bowl; mix well. Form a well in the middle. Add buttermilk and raisins (if desired); mix until just blended. Knead dough 4 to 5 times; add additional flour if dough is too wet. Shape into an 8-inch round loaf. Place on prepared baking sheet. Cut a ¼-inch deep x in the top. Bake for 15 minutes. Reduce temperature to 400º F. Do not open oven door. Bake for an additional 15 minutes, or until bread sounds hollow when tapped. Cool bread for 5 minutes and transfer to wire rack; cool completely. Leftover slices can be wrapped individually and stored in the freezer for future meals.